It is a hardy and undemanding plant. We planted our sorrel patch on the north edge of the farm many years ago, maybe 10 years ago. It goes to seed, we mow half of the patch, and pick the other half while the mowed half regrows. The plants are a pretty, bright green sword-shaped leaves with a tinge of red around the edges. And, nothing is more surprising from a leafy green than to take a bite and find that it tastes like a lemon! The English have added sorrel to salads since at leat the early 18th century. But the French use it in soups and in butter sauces. It also goes well with potatoes and combines well in a mixed green sauté as a tart, citrus accent. 2. Wash, stem, and coarsely chop the sorrel leaves. Melt 2 tbsp. of butter in a sautée pan, add the sorrel, and cook until the leaves are completely wilted and have turned olive green. Transfer to a plate. 3. Peel and slice thin the potatoes. Layer half the potatoes in the gratin dish season well with salt and pepper, and grate a little nutmeg over them. Spread the cooked sorrel evenly over the potatoes. Make another layer with the rest of the potatoes and add enough milk to almost cover them. Season again with more salt, pepper, and nutmeg. Dot the surface with the remaining tablespoon of butter and sprinkle with the grated cheese. Bake about 1 hour, until the surface is nicely browned and the liquid is almost completely absorbed. 1. Peel and dice the potato, onion, and carrot. Melt the butter in a 3- or 4-quart saucepan and add the diced vegetables and the thyme. Pour in 1/3 cup water, cover, and stew gently for about 15 minutes with the lid slightly ajar. Season with tsalt and pepper, add 2 more cups water and the chicken stock, bring to a simmer, and stew another 15 minutes with the lid ajar, until the potato is soft and easily mashed with a spoon. 2. Meanwhile, wash and stem the sorrel, and chop the leaves into a rough chiffonade. When the vegetables are done, add the sorrel, and return the soup to a simmer. Turn off the heat, cover, and let stand for 5 minutes. 3. Purée the soup in a blender and pass through a sieve into a stainless steel bowl. Stir in the cream; taste and adjust the seasoning; let the soup cool to room temperature. 4. Chop enough parsley fine to make about 1 tsp. If you choose to garnish the soup with bacon, fry it now, and chop it fine, rind removed, and then pound it to a paste in a mortar. Mix it together with the chopped parsley. Warm the soup without boiling, pour into a warm tureen, and stir in the bacon and parsley paste, or garnish with the chopped parsley alone. 1. Wash the sorrel in plenty of cold water. Remove the stems and drain well. Cut the sorrel into a rough c hiffonade. 2. Peel and dice the shallots and put in a nonreactive pot with the cream. Bring to a boil, reduce the heat, and simmer for 5 minutes. Add the sorrel and cook for another 3 minutes. Season wtih salt and pepper and a squeeze of lemon juice. Sorrel sauce can be puréed. Serve it with fish, chicken, or potatoes. Note: Another way to make a sorrel sauce is to add a chiffonade of sorrel to a beurre blanc at the last minute. 1. Remove the tough stems and coarsely chop the sorrel leaves. You should have about 4 cups. 2. Combine the sorrel and all the remaining ingredients into a bowl, and let the mixture sit for 15 to 20 minutes before serving. 1. In a good-sized pan, combine the spinach, sorrel, onion, chile, salt, and 1 cup of water. Bring to a boil. Cover, turn the heat down to low, and simmer for about 15 minutes. The spinach and sorrel should have completely wilted by this time. Move the lid so it sits slightly ajar, turn up the heat to medium-low, and cook another 15 minutes. Uncover and either put in the cornmeal slowly or the whole wheat flour mixture. Stir and mash the greens with a wooden potato masher as you do this. You should end up with a coarse purée. 2. Put the oil in a small frying pan and set it over medium-high heat. Put in the garlic. Ss the oil heats, the garlic will begin to sizzle. When it has turned golden on all sides, empty the contents of the frying pan, oil and garlic, in to the pan with the spinach. Stir to mix. 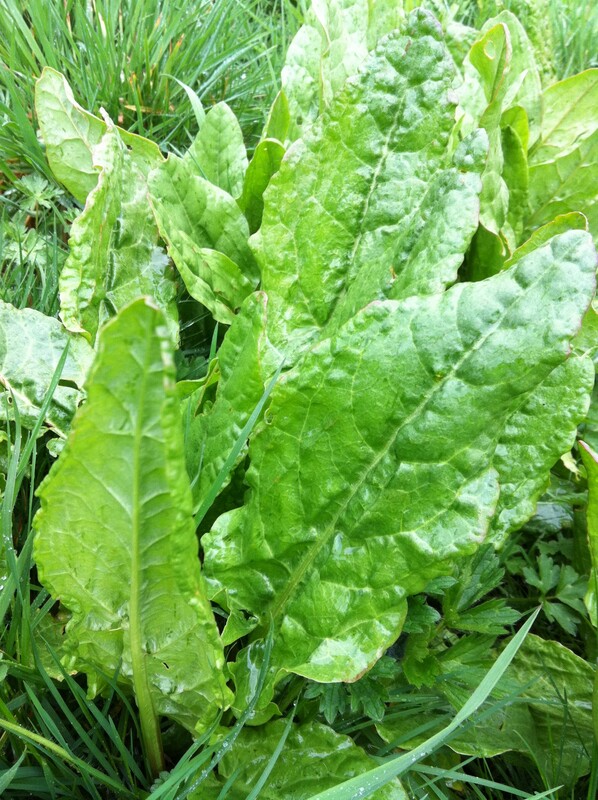 Sorrel is one of our favorite spring veggies…we even have a sorrel patch, which, alas, didn’t winter over too well. Looking forward to this week’s pick-up at the farm!